What could be simpler than moisturizer? You just slap it on, rub it in, and sit back and expect more hydrated, radiant skin, right? You may have noticed that your moisturizer isn’t working like you expected it would. Perhaps your skin is still dry, dull, or maybe even breaking out from it. You may have assumed it was the product itself—that it didn’t have good ingredients or wasn’t a quality formula. That could be true. There are a lot of sub-par products out there. But it’s also possible that your moisturizing technique needs work. Huh? There’s a moisturizing technique? We all know that moisturized skin is younger-looking skin. Dryness exacerbates the appearance of fine lines and wrinkles, and makes skin look dull and lifeless. If your typical routine is just to apply moisturizer when it crosses your mind, however, you’re wasting your money on your moisturizer. Because there’s actually a proper way to apply it to give your skin the maximum benefits. Don’t worry—we’re bringing you this post so you can adopt healthier habits right away that will leave your skin looking a lot more refreshed. You apply moisturizer to hydrate skin, right? So it would make sense that you should apply it to dry skin. This is a mistake. Dry skin typically has a buildup of dead skin cells on the surface. This creates a layer on top of skin that is unlikely to allow any moisturizer through. If you really want your moisturizer to penetrate dry skin, exfoliate first. Try a gentle scrub with raw honey and yogurt. Once you’ve finished exfoliating, then apply your moisturizer. Better yet, exfoliate, shower, and then apply moisturizer immediately, before the dampness on skin evaporates, to help lock in that water content. If you’re rubbing in your moisturizer—particularly if you’re in a hurry to have it vanish—you’re robbing yourself of many of its benefits. 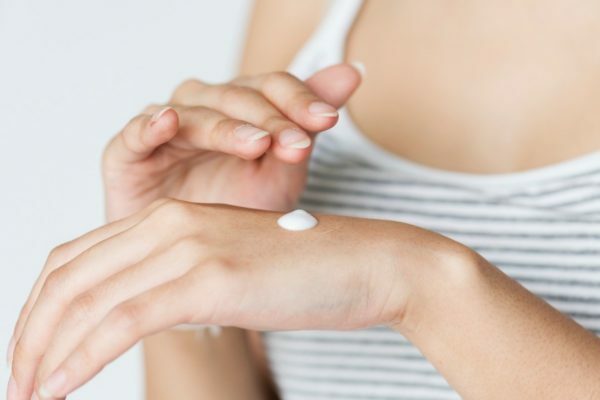 First, you’re creating friction between your hands and your skin, which can cause some of the water content in the moisturizer to evaporate before it even gets a chance to work. Tugging and pulling on the skin—whether with your hands or a towel—can also damage skin, leading to premature aging and wrinkles. Apply gently in circles, with an upward motion. Be particularly careful around the eye area—use the weaker ring and pinkie fingers. Leave a light sheen of moisturizer on the skin and give it time to absorb before getting dressed or applying makeup. You may suspect that your product isn’t working for you, and you may be right. In addition to avoiding potentially damaging ingredients like chemical fragrances, petrolatum, parabens, and the like, you need a natural product that works right for your unique skin type. Drier skin types usually do well with coconut oil, whereas those prone to oily skin may favor grapeseed or avocado oil. Those with oily skin often feel like the last thing they need is more moisture. After all, their skin already feels so greasy! Oily skin, though—especially as we age—can become unbalanced, particularly as you go through clogged pores and the skin is disrupted. If you’re using harsh products, your skin can react even more to the lack of moisture. Over time, it may actually produce more oil to try to balance itself out. Avoid products with mineral oil and other pore-clogging ingredients. Stick with light and gentle moisturizers. Our Herbal Facial Oil for Oily Skin is designed to prevent clogging while balancing your skin's own oils using all natural ingredients. Like the rest of your body, your skin falls into a routine. If you apply moisturizer twice a day, for example, and then go for several days applying only once a day, expect your skin to react. It may get dry, your pores may clog, or respond with more oiliness. Whatever your routine, try to stick with it. We all get off track now and then, but the more consistent you can be with your products, your application, and your frequency, the better your skin will respond. Are you a face-only moisturizing person? If so, you may want to expand your repertoire. The skin is the largest organ we have, and works as a unified system. If you’re neglecting a large part of it, you’re requiring it to compensate, which can rob you of your best-looking skin. Apply moisturizer over the entire body after every shower or bath. You’ll likely want to use a different moisturizer for your body than you do for your face. You may be loyal to one type of moisturizer, but if you’ve been using it for ten years or more, your loyalty may be misplaced. Skin changes as we age. It will require different ingredients in your 40s than it did in your 30s, and so on for just about every decade. If you move to a different climate, your skin may require less or more moisturizer. If you’re going through hormonal changes (menopause, pregnancy), your skin will change, too. Even if you change your diet, you will likely notice a change in your skin. To do: In general, be aware of your skin. Watch how it reacts. If it starts to get too dry, dull, or flaky, step up your moisture with a richer cream or with hydrating masks. If it’s too oily or your pores are clogged, try a different product. Just don’t be afraid to change and try something else if what you’re using isn’t working great. Have you tried our body lotion? We call it Radiant Skin Silk because it’s been known to make skin feel amazingly silky smooth. Get it here. Have you been making some of these moisturizing mistakes? Please share any tips you have with our readers. Just ran across your site when I was researching fractionated coconut oil. Thanks BTW. I love your posts. The simple, clear presentation is a welcome change from so many blogs and sites. I will return here whenever I need new facts about items related to natural skin care. Thanks for this, I think I have been making some of these mistakes, particularly no.1 as I have super dry skin (almost eczema) even though I put coconut oil on every day. I actually stopped exfoliating a year ago because my skin is so sensitive, I thought it was making it worse… Should you exfoliate even with very sensitive skin? (I can’t use honey or yoghurt as I’m vegan.) How often should you exfoliate? Also, what kind of body brush do you recommend (the ones I’ve seen in shops don’t look very soft!)? Thanks so much! I am ‘guilty’ of ALL the above – oh my! Now at least I know & can change it. Thank you all & the few months I’ve had your products are showing great differences ( to the good 😉 I now have to get more moisturizer as I really LIKE vanilla smell, is there a specific reason your changing it? i.e. purer ingredients etc.. Just wondering. People don’t know what their missing so I’ve been ‘sharing’ small amounts for friends to try & they are loving it too. YAY! Blessings & continued success in helping us keep in line so we can SHINE to our best ability! Oh thank you so much! I haven’t seen moisturizing talked about in detail before! I am guilty of some of these which might explain why my skin has been quite inconsistent in texture. Keep up the wonderful posts! I loooooove your page! Keep up the amazing work! I am so lucky i got to know your products. Love them i honestly think they are some of the best out there and i just discovered your blog has such amazing tips too ???? greetz from germany ???????????????????????? Thanks so much!! Glad you found us, too! !